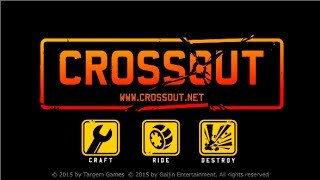 Crossout - register and play! Crossout is a unique new MMO action game where action takes place in a crazy post-apocalyptic world. You are surrounded by a ruined city, which was once a thriving metropolis. Now he lies in ruins, and fighting machines created by you and other players are driving around the maze of empty streets. You are waited by the present design office which itself should be headed. Each player has his own workshop, in which he creates miracles, from separate materials collecting a formidable car and then reviving it. Just imagine the opening potential of this occupation! 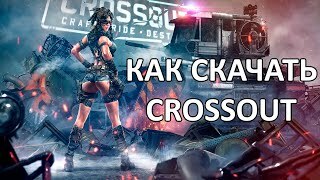 Start Crossout play to fight for the sake of war. Your mission is clear - to shoot and win, to survive in a space where there are no people left. Only machines with monstrous weapons continue to fight, driven by their own idea. Each detail you have to develop yourself, whether it is a rocket launcher, a machine gun or a chainsaw and a drill. Connect the fantasy and come up with unique equipment to become stronger opponent. Now you are the leader of the steel self-propelled soldiers who do not know fear, moving on the enemy, surrounding him and destroying. Take care of the details for melee and ranged. Close contact cannot be avoided, and if the armor is equipped with spare “surprises”, it will be easier for you to withstand and repel the onslaught. It will also “sting” the enemy more painfully and bite off a useful thing from his car, depriving it of its advantages and protection. You will need cars for lighter and heavier vehicles for different tasks. Some will make quick maneuvers and reconnaissance, while more formidable forces are pulled up. Improved and unique designs can be offered to other players at auction. This is a mutually beneficial trade, where everyone sells his military creations. Be creative and courageous so that your product will be in demand. Also, items can be picked up on the field after the battle. The equipment you destroyed leaves a lot of useful, valuable things, and so that it does not disappear and does not get to others who want to profit, pick them up more quickly. This is a completely new approach to creating the game world. Even landscapes with dilapidated buildings look attractive. Coming up with opane machines, arrange a real representation of the death ballet, dissecting on them, cleverly overcoming the rubble of stones, labyrinths of remnants of walls, open fields, acid swamps. The fight itself also looks spectacular - the gnashing of metal, sparks like a fan, lumps of earth from under the wheels. Already the first minutes of being in the playing space are charged with excitement and with the desire to start acting soon. This contributes to the original story, a popular genre, great graphics, an unusual approach to the development of events and interesting special effects.